I hope everyone had a great weekend. I was in Ohio for a few days to celebrate my mom's 60th birthday. It was so much fun, and now I'm back catching up on grocery shopping, laundry, and my super-full Inbox. But before all of that, I'm here to share an awesome book with you this morning! Some of you may have heard of or seen people swooning over the book 318 Patchwork Patterns: Original Patchwork & Applique Designs by Kumiko Fujita. Until now, it's one of those books that has been nearly impossible to get your hands on. And if you were one of the lucky few to have it, all the text inside was in Japanese. Which is perfect if you can read Japanese! :) But I can't. This book has now been translated to English and republished! Yay! I was asked by the publisher to participate in a blog tour to celebrate. 318 Patchwork Patterns is a collection of crazy cute quilt blocks that can be made through freezer paper piecing, applique or foundation paper piecing. There are not directions per block. There are general patchwork template directions and applique directions. If you have never made blocks like this before, I'd highly recommend checking out the Very Kerry Berry blog for a little tutorial on how it is done. 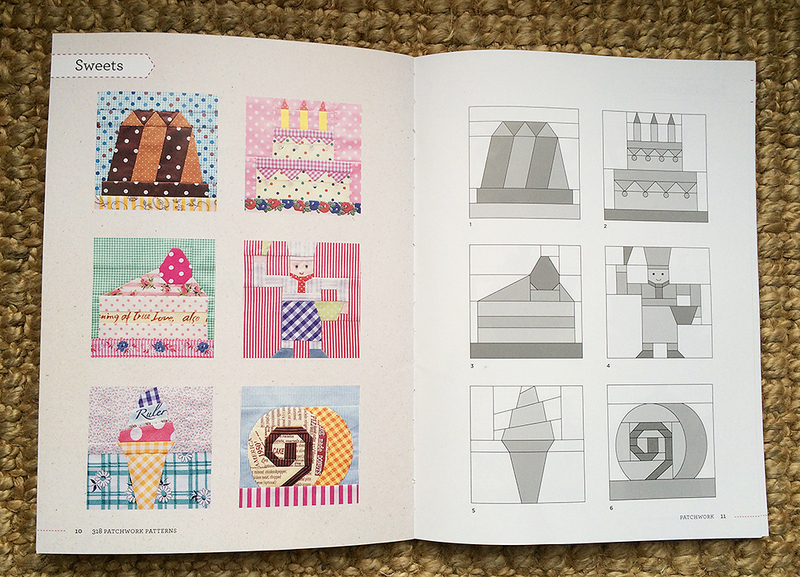 Everyone in the tour has selected a different set of patterns in the book, and made a project using them. I chose to make a project from the Vehicles page. This isn't really my normal sewing subject matter, but my son hardly every gets anything made just for him...so I thought it was a great fit. I decided to focus my design on the rocket ship. I made a mini quilt that uses 3 rockets to make them appear that they are blasting off into space. I used a panel of fabric that I've had since I started quilting from Aunty Cookie in Australia for the heads of the astronauts. The background is an awesome (but sadly out of print) constellation fabric by Lizzy House. I placed wonky stars around the rockets. This was a really fun quilt to make. I foundation paper pieced the rockets. This was actually my test block (I ended up not cutting the rocket into so many piecings, and shrinking the block a couple inches for the final quilt). But you get the picture. The layout was entirely improvised. 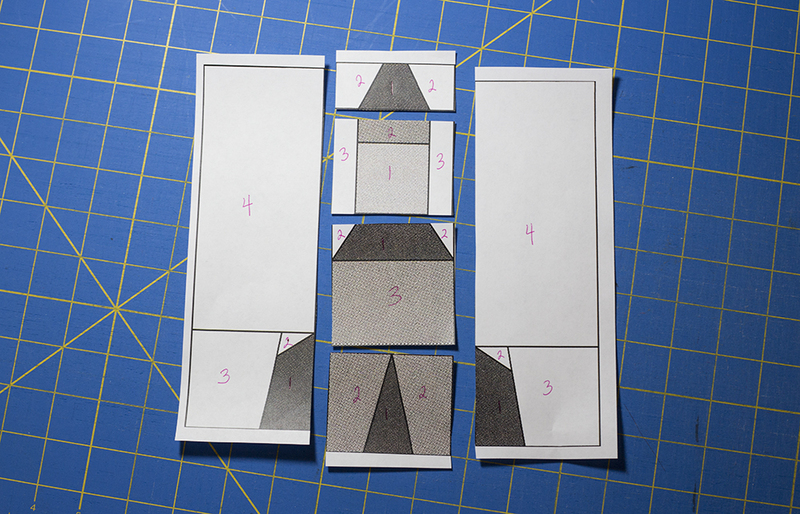 I made the 3 rockets, placing 2 of them at angles and stitching some background fabric around them to form a square. I made the stars all different sizes, added them to the design wall. Then I just started sewing all my blocks together, adding background fabric rectangles where needed. The whole thing is only 24" x 15". It would be perfect for a wall hanging. My son is pretending it's a full sized quilt though, and trying to lay on and under it. :) I quilted it with a free motion meandering design in just the background fabric. I am quite happy with how it turned out! And now for the giveaway! The publisher for 318 Patchwork Patterns, World Book Media, has generously offered to send a copy to one lucky winner. Just leave a comment here and I will pick a winner tomorrow (November 11th). 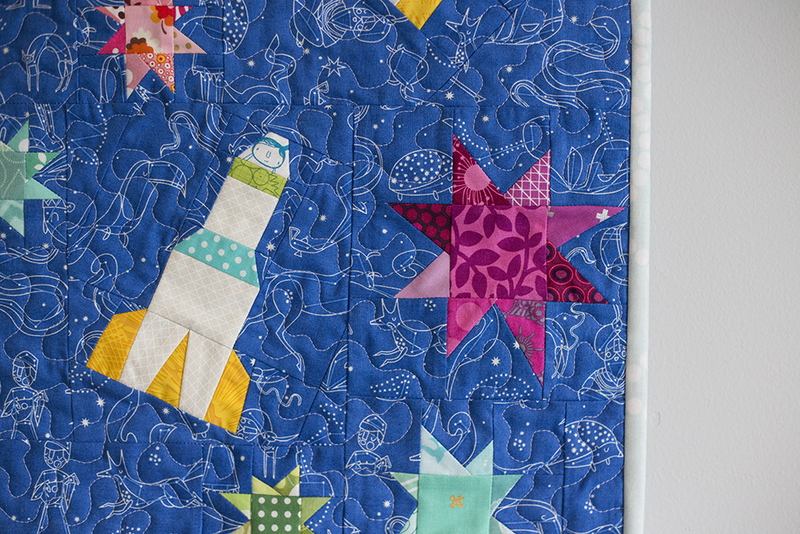 And if you'd like to see more really fun projects from these blocks, check out the stops on this blog tour. The winner is #159 - Sabra! Congratulations! I'll be contacting you for your mailing address to get you your new book. :) Thank you for the kind words everyone!